Valentine’s Day seems to be a polarizing holiday; a love or loathe type of situation that makes people cringe in disgust or happily don headbands with bobbing red glitter heart antennae attached. This year it is just a straight-up polar-vortexing holiday which is neither here nor there and that was just me trying to get in all my vortex jokes while I am able. I celebrated Galentine’s Day a bit early this year (I mean honestly, every day can be Galentine’s Day!) so that I could share this little video with y’all. It is a celebration of lady friend love, booze, crafts, glitter and red wine brownies. Are you ready for a boozy red wine brownie yet? This video was made by the incredible Mackenzie Smith of mackannecheese.com and who you may remember from the Holiday Baking Elf Special: How to Spritz-up Your Holiday Baking with a Cookie Press. She not only knows her way around the kitchen as well as behind the camera, but is a lady friend extraordinaire and someone I’d drink wine out of a measuring cup with anytime. Pick up a heart-shaped cookie cutter, some heart-shaped sprinkles, a bottle of red wine, and your most favorite friends. Happy Galentine’s Day (and Valentine’s Day) y’all. xo! Make the brownies: Preheat the oven to 350. Butter a 9×13 pan and line with two sheets of parchment paper, then butter the parchment. Set aside. Melt the chocolate and the butter together in a heatproof bowl set over a saucepan of barely simmering water, stirring occasionally until melted and smooth. In a large bowl whisk together the eggs, sugars and vanilla. Whisk in the chocolate mixture and then the wine. Add the flour, cocoa powder and salt and stir until the batter is smooth and has thickened slightly. Pour into the prepared pan and bake for 25-30 minutes or until a tester comes out mostly clean with just a few crumbs attached. You may need to bake the brownies for a few minutes more, but set your timer for 20 minutes and then hang out in your kitchen for the last few minutes of baking time just to make sure they don’t over bake. An underbaked brownie is better than an overbaked one. Remove from the pan and let cool completely. 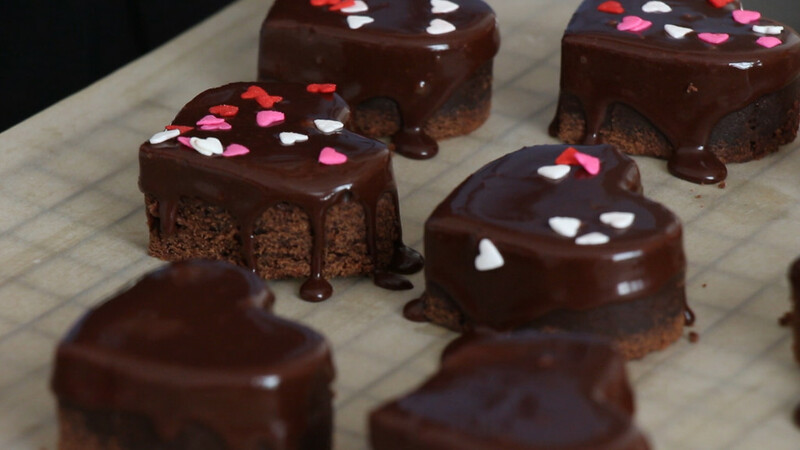 Use a small heart-shaped cookie cutter to stamp out heart-shaped brownies. Save the scraps! 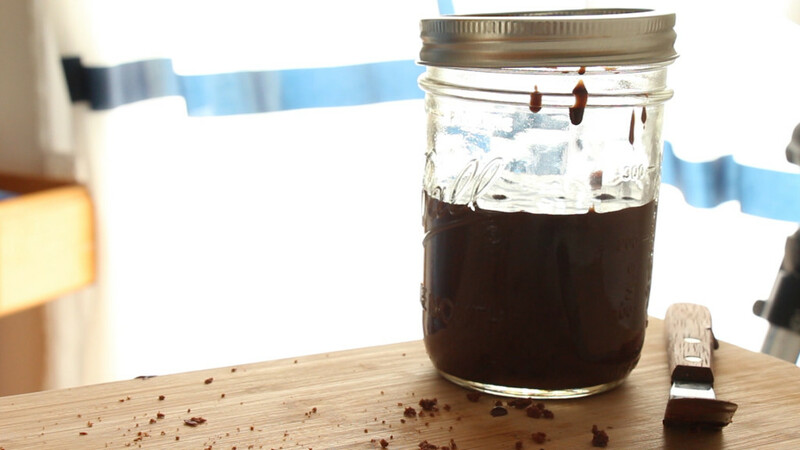 Make the glaze: Whisk together the powdered sugar, cocoa and salt. Add wine, cream and vanilla and whisk until smooth. Dip the tops of each brownie in the glaze and decorate with heart shaped sprinkles. 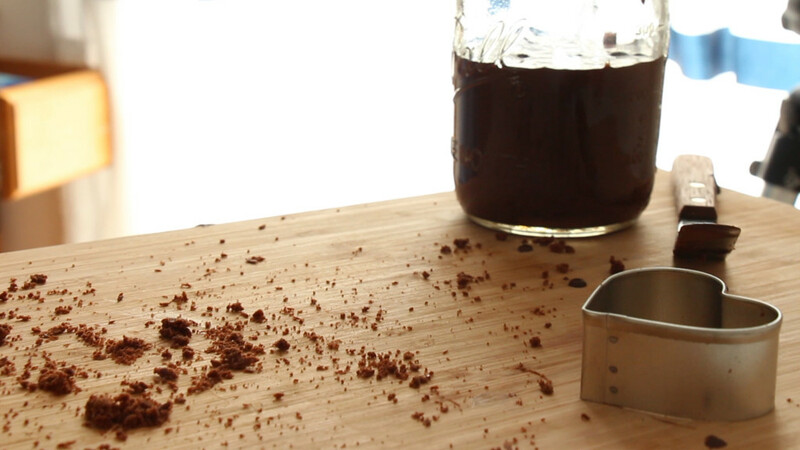 Make brownie balls: Use your fingers to break up the remaining scraps into fine crumbs. Throughly mix in a tablespoon or so of glaze to help the crumbs stick together. Roll into small balls, and then roll into colored sanding sugar. Garnish with one tiny heart sprinkle, if so desired. P.S. A HUGE thank you to Mackenzie Smith for putting this video together but a huge shout also goes out to Josie who took amazing notes and for her internet screen debut, to Jason (of Cowboy) who wrote and performed the music, to Jonny for his work on sound and for everything generally in life, to Bonnie for hosting, and to my Brooklyn lady friend posse whom I love and who needed very little convincing to hang out with a camera, drink wine and craft with the world’s largest container of glitter. Hugs to all! These look fabulous! I love the red wine in there! Looks like the perfect treat – who doesn’t love heart shaped brownies??? Galentine’s Day is such a cute idea!!! 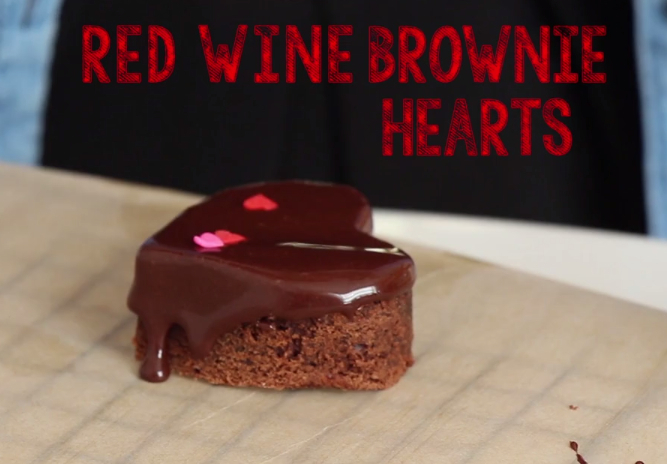 And red wine in brownies, shaped like a heart?! I’m in love! *Love* the notion of Galentine’s Day! Wine & chocolate: what could be better? I hope you have a sweet day! Mack strikes again! Love this. And those brownies look SO good! Happy Galentines Day! Oh my, these look absolutely delicious! And perfect timing, I am hosting a ladies wine night tonight and will make sure to have these to cap off the evening. Thats an amazing and vibrant click. I love your presentation and writing style. First time in your kitchen and I really enjoyed this webspace.